The dedicated electronic control board is designed and produced to control the fan speed and direction of ventilation motors for professional cooking ovens. Automatic: there are 5 preset speed with automatic reversing fan; the operator through oven display can select on of this 5 speeds according recipe. Manual: ventilation motors control is manual means 3 inputs the operator can enable and select rotation direction, while the external potentiometer provides speed regulation. 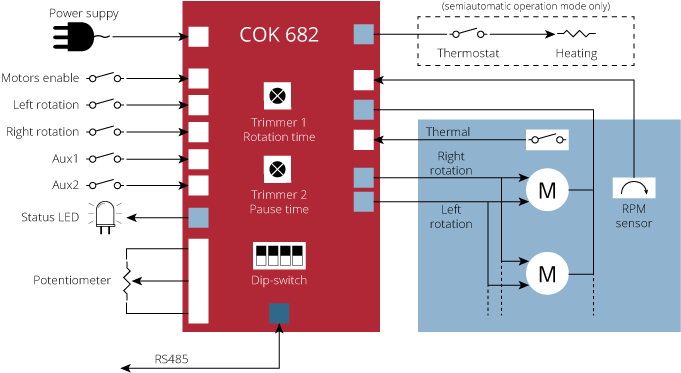 Semiautomatic: this operation mode request the use of on-board trimmers to set rotation and pause time, means 3 inputs the operator can enable the control and select speed (low or high) and ventilation (continuous or reversing fan). This operation mode can use an enable heating to implement a stand-alone control for simplified cooking oven.